There are a number of common problems with the Energic motoculteur B5, C7 and D9 motoculteurs namely. 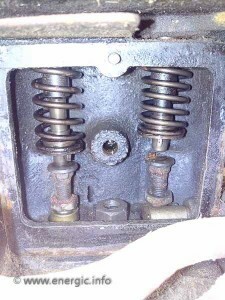 It is important to gently work the stem right to left and back again – with the aid of a release agent/oil. After the oil has penetrated the upper stem and you have placed oil through the exhaust pipe outlet onto the exposed stem – you have a chance to free the stem. 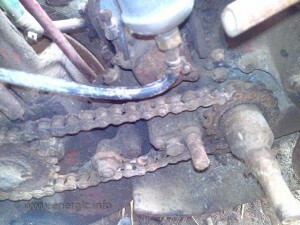 2.Drive chain lubrication (lack of). 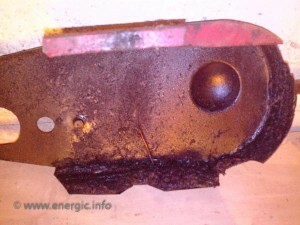 Chain guard, inside should be very oily and dirty like this one. 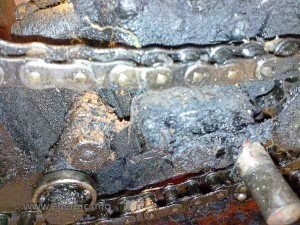 Lubrication is difficult with the chain guard in place but not impossible. 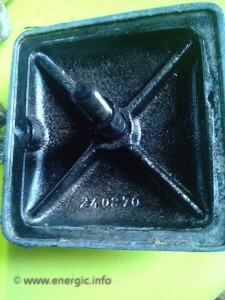 You can also over fill the oil reservoir and the excess will be deposited through the overflow pipe into this area. But this will not lubricate all the chain. 3. Clogging of the chain guide and tensioner. Full clean and de gritting of the ball bearing race. Then re grease, with anti fling motorcycle chain grease. 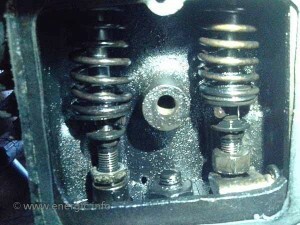 You can hear this problem, by listening closely to the push rod pads hitting the valve stems. There is some adjustment available with the adjustment nut. But shimmy’s are a good solution. These are various thickness steel disc, the same size as the pads. The correct thickness of shimmy can bridge the gap distance caused by wear.